Hey guys! I am back after a slight break, hope you didn’t miss me that much or hope I didn’t miss out on anything hahaha. Well I had the opportunity to speak to one of the Worship Leaders in Aberdeen who has recently recorded her first album. Her Pastor saw me on STV last year talking about my album project ‘Arise’ and asked her to get in touch with me as she was planning to do same. When we spoke I could feel her heart and passion for God. She’s got such a rich tone in her voice and I believe the world needs to hear her. Read my exclusive interview with her and be inspired. Go support her and by her album. I’m Heather Robb, worship leader at Oasis Christian Fellowship who lives in Aberdeen with my husband and two children. I was brought up in a Christian home faithfully attending church every Sunday (kind of had to go as my dad was the minister!!!) I loved going and have very happy memories!! Growing up I was very aware of God’s hand on our lives and I knew that I wanted to continue living this way. I grew up in a Christian home as well and know that feeling ‘lol’ So when did you find out you were called to be a worship leader? I have been involved in praise and worship for many years, and throughout this time I experienced God‘s nudging in this direction. I received a word many years ago from a complete stranger that I was to be used in this area which left me excited and wanting more!!!! I love it when we receive those words that totally just bears witness with our spirits. We understand you have just recently released your debut album ‘Victorious’ Can you please tell us a bit more about this? Why did you choose now to release this album? 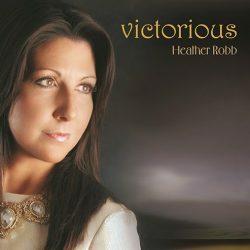 ‘Victorious’ is a collection of worship songs written by myself, although one which belongs to my husband! Having written songs for many years I wanted to put together a little sample of what God’s been doing and share this with others. I believe that everything’s in his timing and although it’s something that has been on my heart for quite sometime I knew this was the time to finally step out!! Timing is so very key! What inspired ‘Victorious’? The title was taken from the name of the song ‘Victorious’ which I believe I received specifically for the cd and it remained with me throughout the process. Life can throw many ups and downs at us but through it all, because he is victorious, therefore so are we!! What do you hope ‘Victorious’ to achieve? I had no personal goal in mind when I set out to do this project other than just wanting to share with others what he has given to me and through doing so that people would hopefully be encouraged and uplifted. What’s your memorable experience as a worship leader? Over the years there has been many times where I’ve witnessed great things in worship. I’m continually left amazed when I see what he can do when we choose to focus on him and lift him up in song, and when we think that all we can give is just small, how he takes it and uses it. Every time in worship can be memorable as he’s always doing something new!! He is indeed always doing something new. What challenges do you face as a worship leader? I guess like others in this role, you go through times where life becomes a little difficult! But I’ve learnt that it’s in these moments that we need to rise up and worship!! Things can always happen to try and throw us off course but choosing to focus on him is often the time when we see great breakthrough and testimony!! I couldn’t agree more with you. Focussing on Him at difficult times. Have there been times you thought of giving up on this dream? If so, what has kept you going? Producing the cd took alot of time and effort but it was something I thoroughly enjoyed!! It was a great experience and I was motivated by the encouragement of friends and family. Thank God for encouraging friends and family. What would we do without them? How do you balance ministry and family life? Mmmmh….life is busy I’ll admit, as I’m sure you’ll know!! and sometimes you plan to have your preparation time and it doesn’t always go according to plan!! I believe God understands life’s demands, especially when you have children which he gave us to look after!! However I do lay aside time for this, as it’s a very important part of the ministry, and having a supportive husband who knows the time out I have to take, is great! You can say that again.Thank God for the children He has blessed us with. Who’s your greatest influence in music? I wouldn’t say there’s anyone specific, as I enjoy a variety of music, but I do feel drawn to the worship style of Kari Jobe and Chris Tomlin and the passion and enthusiasm of the Planetshakers, Hillsongs and Elevation Worship so quite a mix there!! Lovely. Do you play any instruments, if so which and when did you learn to play? I learnt to play guitar as a young teenager (not that long ago really!!!!) and some years later a friend taught me to play the keyboard which gave me a nice choice to write from. That’s awesome. What advice do you have for aspiring worship leaders? (In brief!!!!) try and stay focused on who and what it’s all about!! You don’t need to be part of the biggest and best band but be in the place where he wants you and use the gifts and talents he has given you to help lead others into his awesome presence, and enjoy!!!! Wow I love that ‘ you don’t need to be part of the biggest and best band’! What are your hobbies? Oh painting that’s exciting. Of course music hahhah! How do you see the Christian music ministry/industry in Aberdeen? Things are happening in this area and I think it’s great and very encouraging! Hopefully Aberdeen will continue to experience many wonderful things in its Christian music ministries and find that it’s exciting times ahead!!! -I’m a trained Nursery Nurse but currently a full time mum which I love!! -My sister (also a Nursery Nurse) and I married brothers which is always a great conversation piece!! -I bought my first electric guitar from my husband, that’s when we first met!! -I have written a variety of music for worship, weddings, and child dedications!! -I’ve recently sung for a lady in Fyvie (Ilona Clail) who wrote a song to raise money for children in Africa, it’s called ‘Come Holy Spirit Come’. It can be found on You Tube and iTunes. If you would like to hear some samples from the cd this can be done by visiting iTunes. uplifting and encouragement as you desire.